The AV100 is the lowest of the low-end, with 12MP sensor, 720p video and 3x optical zoom. It's also the cheapest at $100, $10 cheaper than the AX200, which gives you a 5x wide-angle optical zoom for your Hamilton. 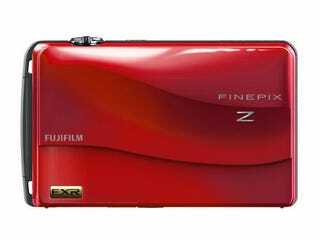 Then there's the F700EXR, Fuji's new 12MP touchscreen model, with one of them fancy internal 5x periscopic zoom lenses. That EXR lens gives surprisingly good low-light performance, and the 3.5-inch touchscreen lets you tag faces for Facebook, navigate menus, tap on your friend's (or dog's) face to focus, all that kind of stuff. It'll run $280 this March. Ready for more? I hope so, because we are nowhere near finished. Go grab another drink and relax a spell! The J series point and shoot is a step up from the A series I already outlined (this'll all be on the test, you slackers). They're too similar to explain in much detail so here's the rub: Four cameras, priced between $130 and $250, all with metal bodies and rechargeable batteries (the A series is plasticky and AA-run). The best is the JV500, a 14MP shooter with a 10x optical zoom, 2.7-inch LCD, 720p video, and pet detection, because Fuji correctly assumes that you'll be taking lots of pictures of your dog. The JV500 is the most expensive at $250, available in March.